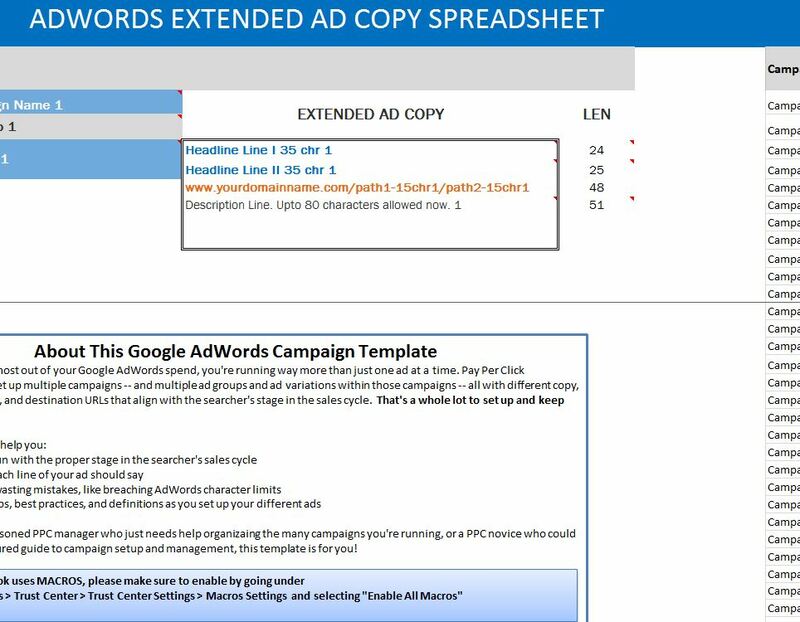 The free AdWords Extended Ad Copy Spreadsheet is the best tool available for people looking to enhance their AdWords campaigns and begin generating great ROI for their ads. The free tool is structured to provide you with a space to enter the essentials of a campaign in a way that you can view it on one page. The advantage of this is the ability to quickly change, edit, or delete aspects of your campaign that are simply not working for you. The template also comes with helpful and handy tips off to the side so you are never without proper guidance. To give this free AdWords Extended Ad Copy Spreadsheet a try, simply continue reading the instructions given below. The free template file is available by clicking the link we have provided at the bottom of this page. Start by reading the instructions that are given in the bottom left-hand corner of the page. This will tell you how to properly format your information for a campaign and tell you about how this template can help, from breaking down lines to an efficient and pleasing structure to avoiding simple mistakes. Take a look at the tables to the far right of the page. This is where you will actually enter the specifics of your campaigns. From a glance, you can tell that structuring this template with your information will be simple. You’ll start by entering the name of your campaign and continue entering the same information that is listed in the highlighted row above. You can then use this information to refer back to if there is a mistake or you need to edit your campaign. There is also helpful information in the upper-left hand corner of the document that tells you the number of characters that is required for each section of your campaign so there’s no way to go wrong on your path to more efficient content.